I would love to provide more about my boat and to be added to your roster. My boat name is "alexanderie." It is a Pacific Dolphin 24. I am not sure but I think it is hull #270. 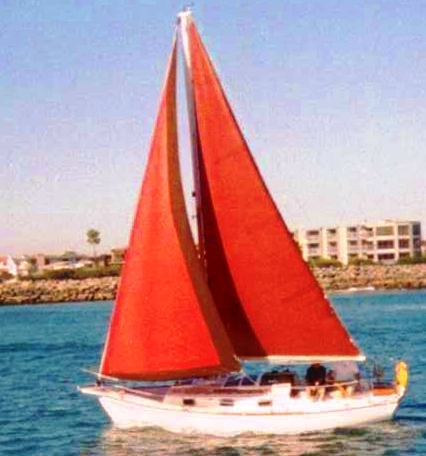 From some of local San diego folks, I have been told that my boat was made for the owner of Pacific Dolphin, Inc. when they took over production. I am not sure if it was his personal boat, a demo or show boat. It has some very unique features: No centerboard, The mast is different (larger diameter), and a lot more wood detail work (inside and out). I am not sure how the performance is different from other Dolphins. My brother has sailed several times with Rick Kennedy and his Yankee Dolphin #149 Boethius. I have changed the entire electrical, replaced the windows, changed the interior post layout, painted the mast, new sails(tan bark), added a bowsprite etc... I have painted the hull forest green, and changed the toerails since the the attached pictures were taken. I will send you more details and photos later. I was reviewing your website and was wondering if you have the contact information for Stan Barnes. I am very curious about how to rig my Pacific Dolphin with a Mizzen sail. 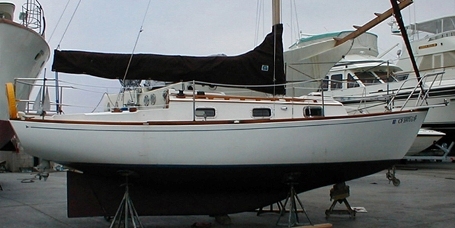 Webmaster Note: Stan Barnes is the former owner of Shamon, O'Day #25, and Will did get Shamon's mizzen mast! August 26, 2013. We have pretty good evidence that Pacific Dolphin #270 is Beaufin in Port Townsend, Washington. We are working on finding out more about Alexanderie's hull number.